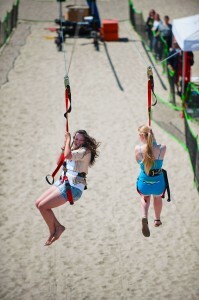 Big Surf Waterpark to feature mobile zipline, the Fly Wire™ zipline in Tempe Arizona. Big Surf Waterpark in Tempe, AZ is adding the award winning Fly Wire™ Zipline, winner of Best Major Theme Park Ride to it’s park summer of 2014. The mobile zipline will be located in the heart of Big Surf’s Waterpark, offering thrill seekers the sensation of flying at speeds up to 21 MPR. Waterpark goers can now air dry by ziplining up to 300 feet above a lazy river and water slides. “What a great way to dry off and cool down. The zipline is the perfect compliment to a waterpark and a great dry-ride solution for parks seeking additional thrills,” states Philip Wilson, Executive Vice President of Marketing with Extreme Engineering. Big Surf Waterpark has nine major water attractions, making the Fly Wire™ zipline it’s tenth major ride for the 2014 season. The waterpark is also ranked with the third largest wavepool in North America. “With one of the largest wavepools in America and a popular concert venue, the mobile zipline will most certainly get attendees excited,” explains Wilson. Extreme Engineering is the world’s largest supplier in patented mobile ziplines, portable ziplines, climbing walls, Extreme Air Jumpers and adventure products for the amusement and resort industries. Today Extreme Engineering manufactures award winning products such as the Fly Wire™ zipline for entertainment enthusiasts on an international level sildenafil citrate generic. Extreme Engineering’s thrilling Fly Wire™ mobile zipline recently won one of the most prestigious industry awards in the “Best New Product” category for “Best Major Theme Park Ride,” earning their 8th total industry award. The award winning mobile zipline provides thrill seekers the ultimate rush of zip-lining across the sky up to 300 feet – the length of a football field. With speeds reaching up to 21 MPH, the Fly Wire™ is the only portable zipline of its kind using the safest decelerator on the market, the Decelinator™, which is a proprietary device that fully lowers zip-liners safely to the ground so riders can soar through the air with confidence. Offering unparalleled “quick cycle times” to serve up to 90 riders an hour, there is no other portable zipline product in the world that can compete with the Fly Wire’s™ completely controlled method of keeping zip-liners safely off the ground. The Fly Wire™ mobile zipline will become a part of several amazing amenities at Big Surf Waterpark, which offers activities for all ages including thrilling waterslides, one of the largest wavepools in the country, great food, concerts, special events and much more. 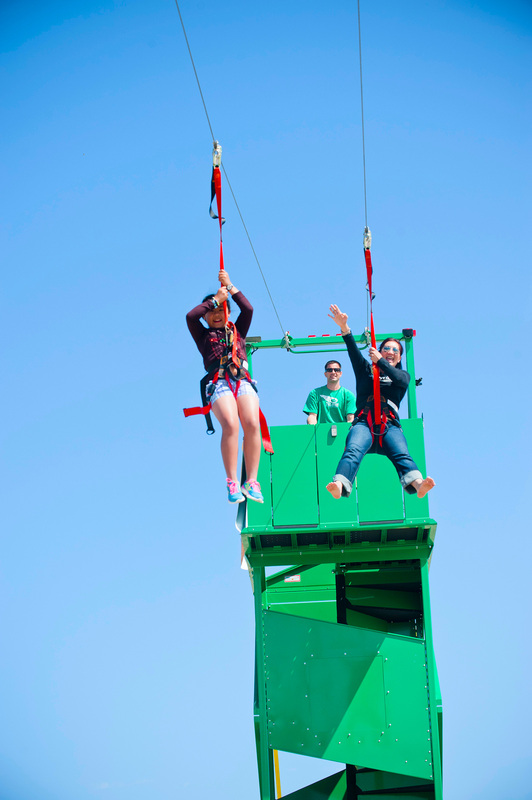 The Fly Wire™ mobile zipline and stationary zipline can also currently be experienced at Westgate Resorts throughout the United States, was featured at several Dallas Cowboys 2013 season home games at AT&T Stadium and Bishop’s Pumpkin Farm in Wheatland, CA. With over 19 years in experience and 5,000 customers worldwide, Extreme Engineering has provided extreme thrills to customers such as Disney, Six Flags, NASA, US Military, Westgate, Marriott and many more. As the original creators of the mobile climbing walls and Auto-belay™ systems, Extreme Engineering has been globally recognized as the primary supplier in zip lines, mobile and stationary climbing walls and extreme, interactive fun. Extreme Engineering is the first company in amusement history to achieve the amazing honor of “Best New Product” 5 years in a row and 8 consecutive industry awards. For more information on Extreme Engineering, please visit www.extremeengineering.com, or email Philip Wilson at phil@extremeengineering.com. Big Surf Waterpark opened on October 24, 1969? In 1965, four years before the “surf center” opened, it was just an idea thought of by a man named Phil Dexter. Dexter took that idea and in 1966 built the first model of his wave machine…in his backyard! The following year he built a larger-scaled model in an abandonded billiards hall in Phoenix. A fully engineered model was built later in 1967, and in the same year Clairol Inc., came on board to help further develop the wave machine. Construction of Big Surf began in January of 1969 in Tempe, Arizona. In September of that year, the surf center opened with a press conference and live surfing demonstration by World Surfing Champion Fred Hemmings Jr. Now, 43 years later, Big Surf Waterpark is home to America’s original wave pool and features over a dozen additional rides for all ages! The famed wave pool is the third-largest in the world, holding 2.5 million gallons of water. Big Surf served as more than just a surf center. It was a popular destination for numerous concerts from musicians like: Pink Floyd, Elton John, the Red Hot Chili Peppers, the Beach Boys, Chicago, Sting, Rod Stewart and many, many more. The concert tradition was revived in 2011 with two Sound Wave Electronic Dance Music festivals. Big Surf was also featured in two motion pictures: Just One of the Guys (1985) and Storm of the Century (1999).